With the rise of Emomali Rahmon (formerly known as Rahmonov) to presidency in November 1992, civil war broke out in Tajikistan. The government of Rahmon was supported by the Russian Federation whereas the United Tajik Opposition (UTO), a loose grouping of interests that drew support from the centre and east of the country and was partially coloured by an Islamist agenda, was supported by Pakistan. The war lasted for 5 years and devastated the country until 27 June 1997, when a peace agreement was signed under the guidance of the United Nations (UN) and with the support of the international community. In the ‘General Agreement of Peace and National Reconciliation in Tajikistan’, the two warring factions agreed upon power-sharing, leaving Rahmon in office as president, but guaranteeing the legalization of opposition parties and giving to the UTO a representation of 30 percent in governmental structures. However, the promise of political pluralism has never been adequately realised. Want to get notified by mail when Tajikistan gets updated? Emomali Rahmon was born on 5 October 1952 in Kulob, Tajikistan. He has been the country’s head of state since 20 November 1992. Rahmon served in the Soviet army in the early 1970s, before joining the administration of a collective farm, where he worked from 1976 to 1988. In 1982 he received a degree in economics from Tajik State University. In 1990 Rahmon was elected to the leadership of the Tajik Soviet Socialist Republic. The government collapsed after Tajikistan descended into civil war in 1992 and following political reshuffling in an attempt to resolve the stalemate, Rahmon was named head of the government. Rahmon’s leadership survived the five-year civil war, despite assassination and coup attempts during the violence. In November 1994 he was elected President of Tajikistan. In the 2013 presidential elections, Rahmon won a fourth term. Rahmon represents and leads the People’s Democratic Party of Tajikistan, which has a majority in the parliament. Under Rahmon’s leadership the international community has raised several concerns about human rights abuses, press freedom, and election rigging. The parliament of Tajikistan (Majlisi Oli) is comprised of two chambers. The assembly of representatives (Majlisi Namayandagon) is the lower chamber with 63 deputies directly elected for a five-year term. Twenty-two members are elected through a proportional party list system within a single nationwide constituency with a five percent threshold for seat allocation. 41 members are elected in single-mandate constituencies under a majoritarian system. In these contests, if no candidate gets more than 50 percent of the votes cast in the first round, the top two candidates compete in a second round within two weeks. A 50 percent turnout of registered voters is required. The upper chamber (Majlisi Milli) contains 33 members, who are indirectly elected. 25 of them are elected for a five-year term by deputies of local majlisi and 8 are appointed by the president. The parliamentary elections are primarily regulated by the 1994 constitution and the 1999 Constitutional Law on Elections to the Majlisi Oli (election law). The constitution provides for rule of law and fundamental civil and political rights and freedoms, necessary for the conduct of democratic elections. However, the general legal framework including a series of new or amended laws affecting media, civil society and religious organizations have narrowed civil and political freedoms. Although there are no legal formal impediments to women’s participation in elections, women are significantly underrepresented. This is largely due to the traditional social, cultural and religious norms that preferentially situate women in the home. The 0 contribution to present one’s candidacy is an extra obstacle for women to compete in elections, whereas women are generally discriminated upon in terms of pay and are therefore even less likely than men to have such an amount of money available. Furthermore, family voting is common practice in Tajikistan. In these cases, it is usually the men who vote for all family members. This leaves women with little opportunity to choose a woman whom they feel represented by. There are no special legal measures to promote women candidates. Some candidates and civil society activists stated to the OSCE/ODIHR EOM that the financial deposit and higher education requirements disproportionally affect potential women candidates. Some 24 per cent of candidates were women for the nationwide contest and 17 percent for the single-mandate contests. Only a few women were placed among the top candidates on parties’ electoral lists. Although the legal framework of Tajikistan provides for equality between women and men in public and political life, there is a general consensus among women’s advocacy organizations that laws rarely go beyond a mere statement of equality and implementation remains insufficient. The main ethnic group in the country is Tajik, accounting for 84.3 percent of the population. Other groups include Uzbeks (13.8 percent), Russians (0.5 percent), and Kyrgyz (0.8 percent). A variety of ethnic groups comprise the remaining 0.6 percent. There is no overt discrimination against these minority groups, nor are there any formal barriers for their full participation in the electoral process. At the same time, it is noticeable that in particular the large Uzbek minority does not appear to be actively engaged in the political process. During the 2015 parliamentary elections, they did not feature as candidates and political parties did not have messages designed to appeal to Uzbek voters. It should be noted in this respect that power is distributed on the basis of regional identities rather than ethnicity, and it can therefore be said that apart from the Kulobis (president Rakhmon is a native of this region) all groups in Tajikistan seem to be underrepresented. Most Uzbeks are loyal to current president Rakhmon. On a more positive note, the government of Tajikistan does try to actively engage the minorities in the election process by printing ballots in multiple languages. During the 2015 parliamentary elections, ballots were printed in Tajik, Uzbek, Russian and Kyrgyz. The most recent parliamentary elections in Tajikistan took place on 1 March 2015. According to the preliminary results, President Rahmon's ruling People's Democratic Party won 65,02 percent of the votes. For the first time since Tajikistan's independence in 1991, the Communist Party and oppositionist Islamic Renaissance Party (IRPT) failed to meet the 5 percent threshold required to win seats in parliament. The Social Democratic Party failed to meet the 5 percent threshold as well. The Tajik parliament therefore does not have any opposition. However, the Communist Party did manage to win two seats by winning in two single-mandate constituents. The OSCE Office for Democratic Institutions and Human Rights (OSCE/ODIHR) was invited by the Tajik authorities to monitor the elections. They concluded that the elections failed to meet the OSCE standards. The parliamentary elections took place in a “restricted political space” and “failed to provide a level playing field for candidates”. The international monitors stumbled upon various problems that harmed the credibility of the elections. The monitors spoke of restrictions on freedom of expression and assembly, press freedom and accessibility. On top of this, the administration was not impartial. Numerous cases of proxy voting and ballot-box stuffing were noted. Counting procedures were also disregarded, meaning that an honest vote could not be guaranteed. More than half of the votes counts observed were assessed negatively. The state-run media failed to provide a genuine political debate. Criticism against Tajik officials and authorities is unheard of as insult or slander against senior government officials or candidates for parliament is a criminal offence. Because of this journalists have been forced to self-censorship. Political campaigning was made impossible as slots for political parties and candidates were aired long before the election date. The coverage during the campaigning period solely focused on the state authorities. Combined with negative reports on the opposition IRPT the media failed to provide the voters with the possibility to make an informed choice. 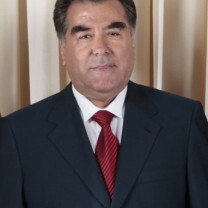 Tajikistan’s President Emomali Rahmon, candidate of the People’s Democratic Party of Tajikistan, won a new seven-year term in the 6 November 2013 elections with 83.1 percent of the votes. The Tajik Central Election Commission (CEC) announced the turnout was 86.6 percent. Rahmon, who is in power in the poorest former Soviet republic since 1992, thus began his fourth term. He has increased the number and length of the president’s terms by revising the constitution through a referendum. The term he is currently facing will be his last one, according to the constitution. Rahmon ran in the presidential campaign against five little-known, even inside the country, and largely loyal candidates. Among these candidates were Secretary of the Communist Party and MP Ismoil Talbakov, Chairman of the Democratic Party Saidjafar Ismonov, Chairman of the Socialist Party Abduhalim Gafforov, representative of the Agrarian Party Tolibbek Bukhoriev and Chairman of the Party of Economic Reform Olimjon Boboyev. The two main parties in the opposition, the Islamic Revival Party (IRP) led by Muhiddin Kabiri and the Social Democratic Party (SDP) led by Rahmatullo Zoirov created the Coalition of Reformist Forces and put forward the candidature of female rights lawyer Oinihol Bobonazarova. However, the potentially most significant rival candidate of the moderate opposition Islamic Revival Party, was banned from the polls after failing to collect the necessary 210,000 signatures of eligible voters to be officially registered. The OSCE stated on this that "restrictive requirements, including the unreasonably large number of signatures potential candidates must gather to qualify, present significant obstacles and are at odds with OSCE commitments and other standards for democratic elections". The opposition accuses Rahmon of developing a personality cult. Rahmon himself denies this claim. A main opposition party, the Social Democratic Party, boycotted the elections due to "violations of the constitution, organised falsifications and a lack of democracy and transparency". A group of international observers has said the Tajik presidential election lacked pluralism and genuine choice. Presidential adviser to the OSCE’s Parliamentary Assembly, Andres Baker, said together with an OSCE observer in Dushanbe that "while quiet and peaceful, this was an election without a real choice". "While there was extensive state media coverage of the official activities of the incumbent president, that meant that he had a significant advantage throughout the campaign", Baker added. Rahmon’s supporters credit him with securing peace and stability in the wake of the country’s five year civil war in the 1990s. However, he is widely criticized for marginalizing the opposition, cracking down on independent media, and mishandling the economy. Besides, Tajikistan has no record of free and fair elections. In spite of the easy victory, critics have said Rahmon will face rising social tension in his country where about 50 percent of the population lives in poverty. More than one million Tajiks migrants work abroad, especially in Russia, sending money home to their families. The Social Democratic Party is in vocal opposition to President Rahmon. The party was founded in 2003 by former legal advisor of the president Rahmatullo Zoirov, who resigned in 2003 over the referendum that increased the possible presidential terms of Rahmon until 2020. This was interpreted by Zoirov, as by many others, as an increasingly authoritarian approach by the incumbent president. In the 2015 parliamentary elections, the Social Democratic Party received 0.5 percent of the votes, failing to meet the 5 percent threshold required to win seats in parliament. The People’s Democratic Party of Tajikistan was formed during the Tajik Civil War in December 1994 as a pro-government party. In March 1998, President Rahmon joined the party and was elected as chairman. The party is currently the ruling party of Tajikistan and has over the past years considerably increased its power over the country. Opposition parties, that were rewarded a 30 percent share of state functions within the framework of the 1997 Peace Agreement, have been pushed out of official functions in favour of PDP representatives. During the 2015 parliamentary elections, the PDP allegedly received 65.4 percent of the votes, and was appointed 51 out of 63 seats. President Rahmon was re-elected in 2013 with an official 83.07 percent of the votes. The PDP considers itself a centrist, parliamentary political party and aims “to unite all citizens of Tajikistan, regardless of language, ethnic affinity, social status or political beliefs … for the establishment of rule of law and a sovereign, democratic and secular state”. The present-day Communist Party (CP) of Tajikistan registered in March 1992. It was created on the base of the Communist Party of the Tajik Soviet Socialist Republic, which was formed in 1924 and was in power from then until 1990. However, in the 1990s power was taken over by Rahmon. The stated aims of the Communist Party are the "economic and social construction of the country after the Tajik Civil War". This should be done within the framework of the "traditional society based on collectivism, mutual help and respect of tradition and family values". Furthermore, the CP opposes national or state oppression, and calls for a society based on the "ideas of peace, justice, equality, brotherhood, cooperation and mutual help". This would ultimately lead to a new social form, referred to as ‘society socialism and communism’. The CP intends to take a neutral stance towards present-day power balances in Tajikistan. It does not necessarily support the regime, but it works together with the PDP in a number of districts. The Party of Economic Reforms was established by Olimjon Boboyev in the autumn of 2005, several months ahead of the parliamentary elections. From the start, there have been strong allegations that the PER is a so-called ‘pocket-organisation’, a party loyal to the incumbent president and government, set up to create the idea of a multiparty-system and to distract the neutral and moderately-opposing voters from the real opposition. The problem-free registration of the party at the Ministry of Justice justifies this suspicion, especially since most opposition parties face mounting problems over registration. Also, since its establishment, the PER has refused to participate in the opposition Coalition for Free and Fair Elections. The PER has no clear ideology, but advocates for a genuine reform of the structure of the Tajik economy. According to the PER, such a reform is needed in order to support the growth of the economy, most noticeably in the manufacturing of finished products. The Agrarian Party was established by Amir Karakulov in the autumn of 2005, several months ahead of the parliamentary elections, in a similar fashion as the Party of Economic Reforms. It is therefore not surprising that similar allegations of the party being a pocket-organisation are voiced against the AP. Again, the problem-free registration of the party and the party’s refusal to participate in the opposition Coalition for Free and Fair Elections serve to justify such suspicions. The AP has no clear ideological outline, and mainly focuses on the issue of agricultural production. The party advocates for a halt in export of raw materials from Tajikistan, and for the country to switch to the production and export of finished products. During the 2006 presidential elections the AP fielded its head, the relatively unknown Amir Karakulov, as a candidate. The Islamic Revival Party (also known as the Islamic Renaissance Party) grew out of an underground youth organisation in 1978, and it was the only legally existing Islamic party in Central Asia. The party was banned in the 1990s during the power struggle between president Rahmon and the United Tajik Opposition (UTO), of which the IRPT was the (armed) backbone, but was legalised again in the June 1997 peace agreement and turned towards peaceful practices. The party advocated an Islamic state through peaceful, gradual change in Tajik laws. According to the IRPT, the Islamic state should be achieved stage by stage and in accordance with the wishes of the people of Tajikistan, and within the framework of the constitution. In the 2015 parliamentary elections, the IRPT failed to meet the 5 percent threshold required to win seats in parliament, for the first time in 15 years. In August 2015 the Tajik Justice Ministry banned the party and gave it 10 days to halt all activities. According to a statement issued by the ministry, IRPT could not legally continue its activities because it does not have enough members to qualify as an officially registered party. On 29 September the high court ruled that the party should be included on a blacklist of extremist and terrorist organizations. The court's decision forces the closure of the IRPT's Najot (Salvation) newspaper and bans the distribution of any video, audio, or printed materials related to the party's activities. The Tajik Prosecutor-General's Office accused the IRPT leadership of involvement in a deadly alleged mutiny this month by a serving deputy defense minister, Abduhalim Nazarzoda. The IRPT denies these accusations, but more than 20 IRPT members were arrested on charges including terrorism, inciting religious and racial hatred, and attempting to seize power by force. Many also face forgery, fraud, and other economic crime charges. Leader Muhiddin Kabiri was not subject to the arrest, because he remains in a self-imposed exile. Rahmatillo Zoirov was born in 1958 in Borgustan. 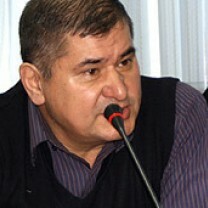 He is the chairman of the Social Democratic Party of Tajikistan, which was formed in March 1998. At the time, the party was referred to as a party of justice and development. However, in 1999 when the party was registered, the Ministry of Justice addressed the Supreme Court to stop the activity of the party and the registration was cancelled. Under a new title the party was registered in December 2002. Zoirov has been its leader since then. The party did not participate in the presidential elections of 2006 or 2013, nor is it represented in the parliament of Tajikistan as it did not gain any seats in the parliamentary elections of February 2015. Zoirov makes a living practicing law outside of Tajikistan. In 1983 he graduated he graduated from the Ukrainian Law Academy. In September 2006 Muhiddin Kabiri was elected Chairman of the Islamic Revival Party of Tajikistan, which was the only legal Islamist party in Central Asia. He was already elected into parliament in 2005. Kabiri was born in 1965 in the Faizobod district in Tajikistan. Unlike many in the party hierarchy, Kabiri did not play any role in the Islamic opposition’s conflict with the government in the period from 1992 to 1997 and had no Islamic education. Kabiri was known as a moderate and pragmatic politician with explicitly pro-Western views, which many of the more conservative party members, particularly those with links to Iran, found difficult to accept. Kabiri is a member of the parliamentary Committee on Science, Education, Culture and Youth Police. Since 2015 Kabiri has been living in self-emposed exile outside of Tajikistan. Oinihol Bobonazarova, born in 1948, was the first woman to enter a presidential race in Tajikistan. She is a human rights activist and director of an NGO that works especially with migrants’ rights. As a former collaborator of the Soros foundation and the OSCE, she was put under house arrests in the early 1990s for her opposition activity. For many ordinary Tajiks, the candidature of a woman for the 2013 presidential elections came as an unwelcome surprise. In a conservative country where according to Amnesty International nearly half of the female population is regularly subject to violence and abuse, Bobonazarova stressed the importance to empower women in Tajikistan. Tajik president accuses fugitive deputy defense minister of attacks that killed 22. Iji (2005), Cooperation, Coordination and Complementarity in International Peacemaking: The Tajikistan Experience.